Cars are safer than they used to be. But car accident injuries and deaths are not falling in pace with these advances. Why? New technologies are distracting us as we drive. The most notable of these technologies may be text messaging. Many of us pride ourselves on being able to multitask. You can't multitask in a car. 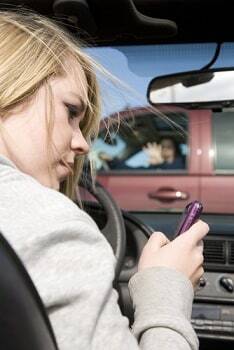 If you are texting while you are driving, you simply are not capable of focusing on anything else. If you look down for a five-second text, you may have traveled 100 yards. A lot can happen over that 100 yards. In Maryland, it is too often that "a lot" can mean hurting or killing someone else or yourself. Maryland law prohibits texting and emailing while driving. The first texting while driving law took effect in 2009. It started off very weak, allowing the use of hand-held cell phones and allowed drivers to read texts. The Maryland legislature has tightened that ban every year. It now includes a full ban that includes texting at red lights, a portion of the law few people knows about. But the law prohibits all Maryland drivers from using an electronic device to write, send, or read a text message or email while the car is on the road. For text senders under 18, the ante is upped dramatically: 90-day license suspension and license restriction (the maximum penalty). Keep this in mind: the average teenager sends over 3,000 texts a month. Maryland law expressly prohibits texting and handheld cell phones. Too many people - particularly teens - ignore this law. The problem with the Maryland texting law - and the law in most states - is that too many texting-while-driving statutes are under-inclusive and impose penalties that are just too lenient to deter texting while driving. The fine in Maryland for texting while driving is $80 and one point on your driving record. But the likelihood of getting caught is small, the punishment is rather insignificant, and the temptation is just too much for too many Maryland drivers. According to one 2012 study, over 1/3 of drivers send and receive text messages while driving. Almost 20% say they do it regularly. Interestingly, there have been no appellate cases in Maryland that involve a texting while driving car crash. But you can't expect that to go on much longer. There are two big things to keep in mind if you have a texting accident claim as opposed to an ordinary negligence action: (1) how to get the fact that the driver was texting into evidence even if they admit liability, and (2) gathering the proof to show that the driver was texting while the accident happened. If a jury believes that a driver is texting, you are going to win and the award is going to be higher. The challenge in getting this into evidence is when the driver admits responsibility. Technically, under Maryland law, this should not come into evidence. But there are a few evidentiary arguments that good lawyers can make to often get the evidence admitted at trial. Our firm has a rich history of success in getting great settlements and verdicts in car accident cases. We have prevailed at trial in hundreds of car accident cases in Maryland, and successfully settled thousands of motor vehicle collision claims. If you or someone you love has been injured or killed in a car accident, call our law firm at 800-553-8082 or get a free consultation online. How many points do you get for texting while driving?